Kevin Gamble, who plays Johnny Johnny on Tiki Bar TV, tells the amazing story of how he jumped down onto the subway tracks at the L train station at 3rd Avenue in New York to save a woman’s life after she fell off the platform and hit her head on one of the rails. Bravo Kevin, making cocktails and saving lives, now that’s a true hero! See, I was waiting for the L train at 3rd Avenue just minding my own business when this lovely lady in her 50â€™s decides to peer down the track to see how far away the oncoming train is. You know the one Iâ€™m talking about; the one with the 6 foot drop from the platform that leads down to two metal rails? When all of a suddenâ€¦ she falls over the edge. She hammers the back of her head on the second rail and goes basically limp. I figure the next train is about 60 second away, so I immediately leap over the edge and basically break all forms of first aid protocol. 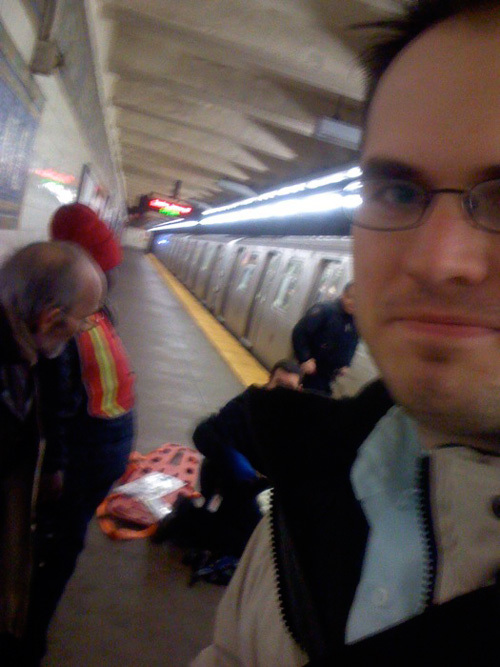 I quickly weigh the odds – she COULD have a spinal injury that Iâ€™m aggravating, but Iâ€™m going to assume that a POSSIBLE injury is less dangerous than the CERTAIN DEATH sheâ€™s going to face when she gets run over by the L train. So I haul her up on my shoulder, at which point she comes too, and I quickly get her back to the edge and holler at a couple of dudes to grab her arms and pull her up.